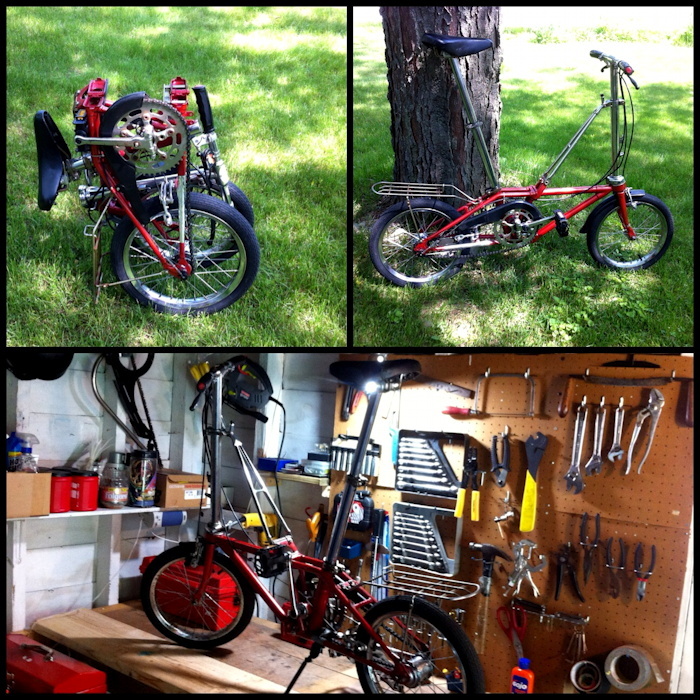 Earlier this year I picked up an older Dahon folding bike for cheap. It worked, but needed some TLC: the wheels were lopsided, the rotating parts (hubs, pedals, crank) needed lubrication, and the folding mechanisms were all a bit sticky. I had the wheels trued at the bike shop. I greased all the bearings and replaced the gummy old pedals. Today I freed the seized-up seatpost and re-adjusted the brakes with newer pads. It’s still a bit of a rattletrap compared to the precision standards set by my main bike, but now it is ready to ride! Posted on Friday, May 31st, 2013. Tags: bike.